Hello, Eeee-va, no, they can't repair the trail because the whole cliff/ridge deteriorated to the point of erosion and doesn't exist anymore like chunks of it just fell off. I used to ride all the roller coasters but I'd say about the last 12 years I started losing my interest in them and now for sure I'm like meh. But I'd still go just to see it probably at some point, Knotts Berry Farm, that is. I haven't been to DisneyLAND in ages (have been there 3 times total) and I've never been to the Wild California park. 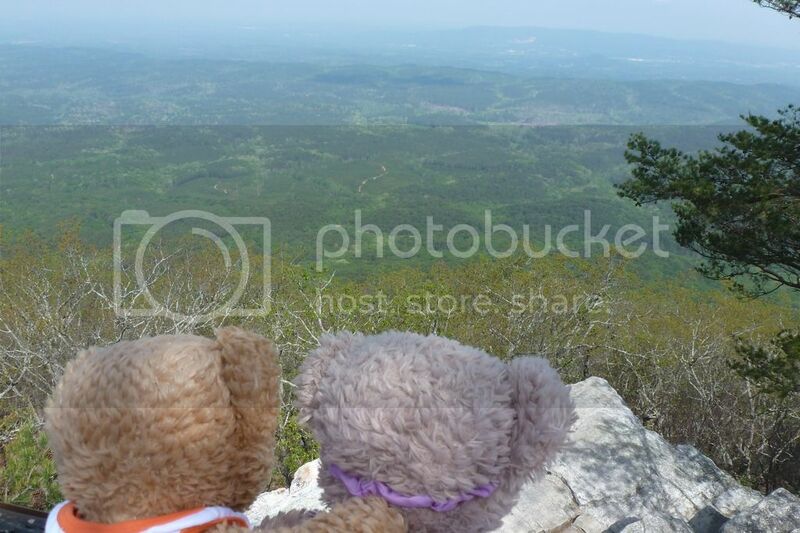 Da bears and I went hiking today in Alabama but it might be a few days before I get the pictures loaded up. Thank you for the tips on the park (smiley),. I toured the Queen Mary when I was 12 years old; I didn't know they made it into a hotel now. So can you still tour it or is the whole thing converted? Is it still in Long Beach? Last edited by JillT; 04-16-2017, 04:58 AM. Saturday dawned with a forecast in Alabama of 85F, mostly sunny, and low humidity. "Bring on the sleeveless shirts and shorts. Summer is here!" exclaimed da bears happily. 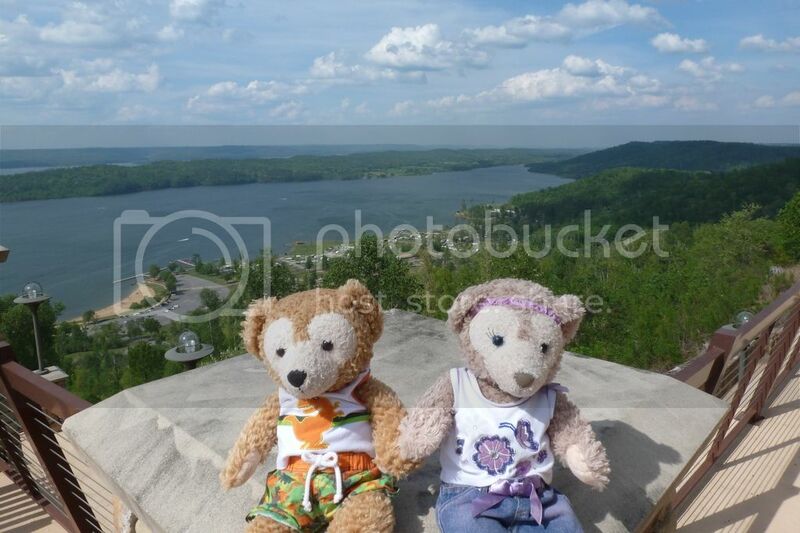 First we stopped at an overlook in Alabama. Then we went to Marshall County park. Next it was time for our first planned activity since the other two were spontaneous as we were passing by. 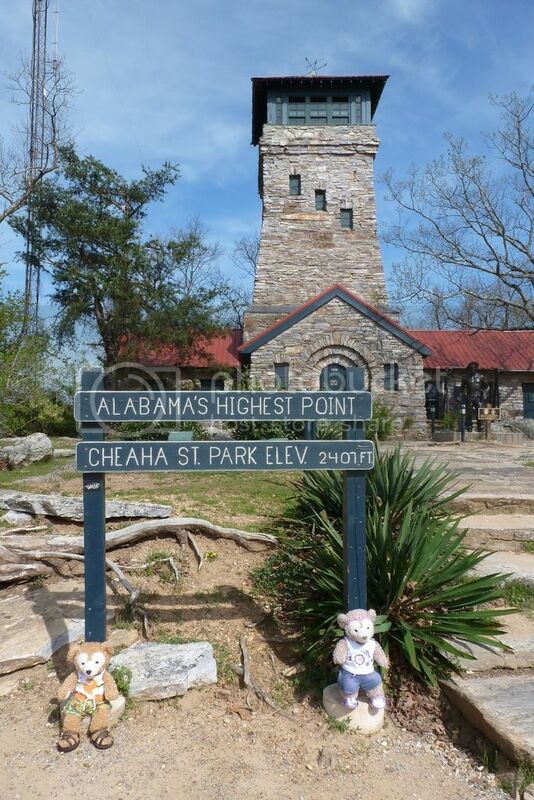 Cheaha State Park has the highest peak in Alabama, at 2,407 feet above sea level. 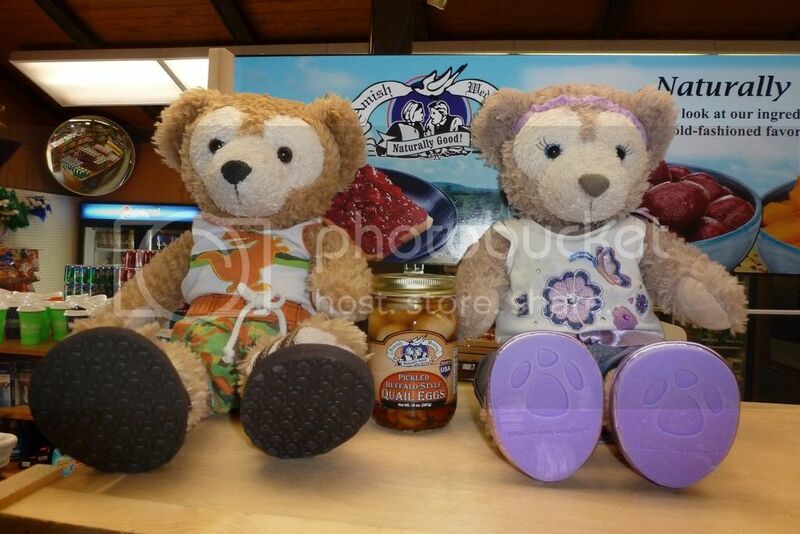 However, da bears and I were hungry even though I had snacks and drinks in the car. Not being into PICKLED eggs in the first place, I declined to try THESE! "That's okay, we'll just go see the scenery," they said. 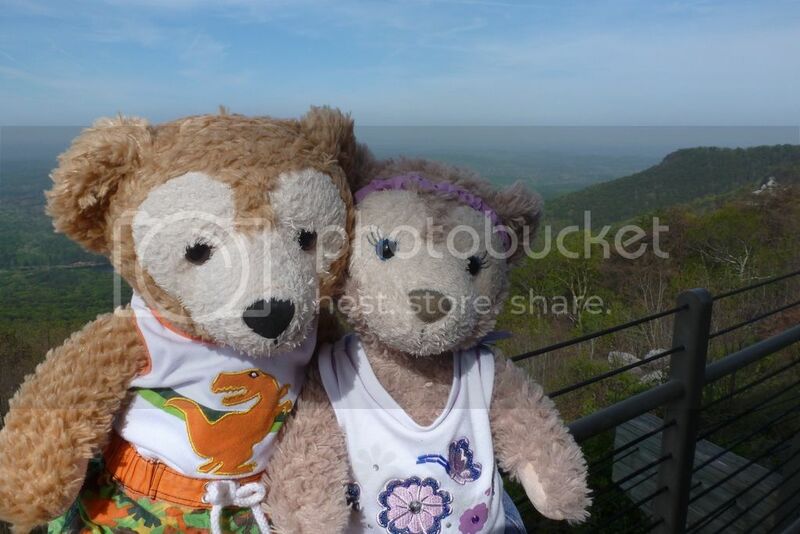 We got to go up in the tower but the view wasn't as nice here. The Bald Rock trail was a boardwalk and handicapped accessible. 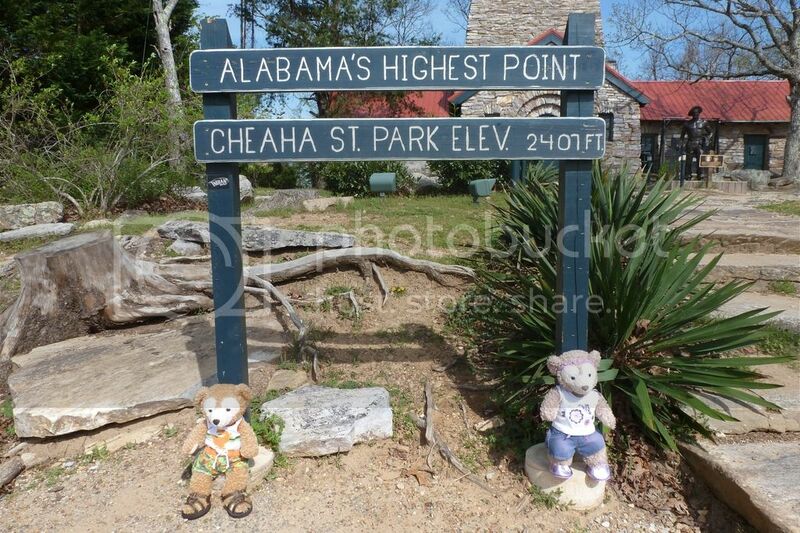 Even da bears got some exercise because it was only 0.3 miles one way. I carried them back, though. Next we went to High Falls park, which was in a REALLY rural (think "supposed" two lane road with plops of pavement thrown down) area. The waterfall was 35 feet tall, 300 feet wide, with sections of it because the way it went over the edge curved and there was even a stone arch/natural bridge that the water went through. That was the left side of the waterfall and unfortunately too much foliage was in the way for a photo or a video to turn out. 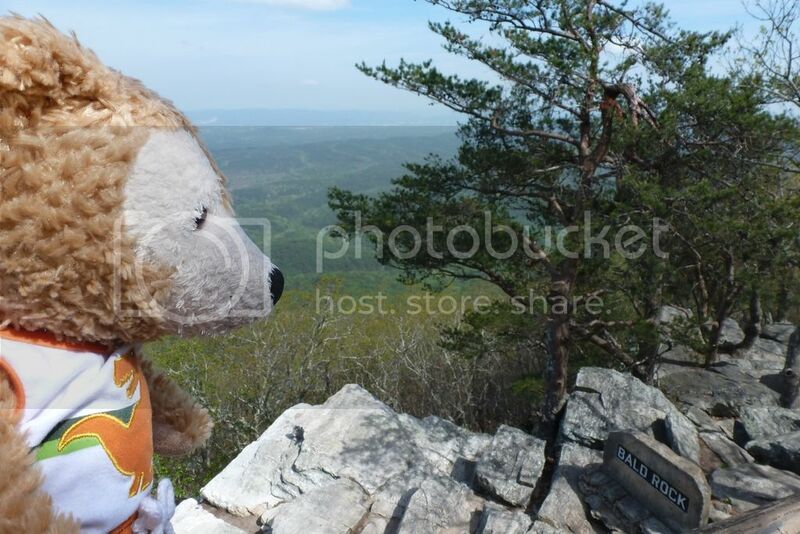 Duffy had looked over the barbed wire fence (the trail is literally a thin piece of dirt right up to the fence which is somehow anchored at the very edge. 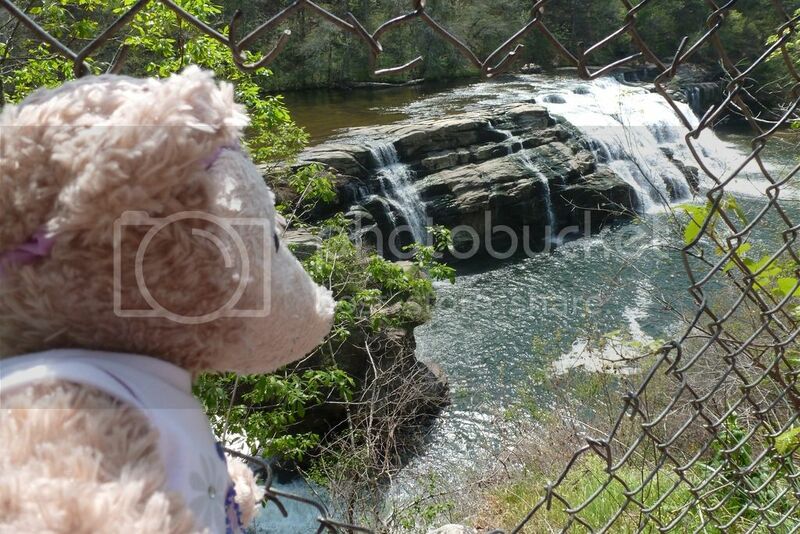 "Oh, look, some thoughtful people cut a hole in the fence where we can get a better view," said Shellie May. I decided to keep her innocence by not informing her that was vandalism. Shellie May's head is blocking where I could see the natural bridge but you can see how blocked the view would be. We also walked across a pretty bridge. Next we visited Lake Guntersville State Park, which was supposed to have a waterfall and a cascade, but the trail map said seasonal depending on water levels. I asked at the lodge and they said you have to see those within hours of rainfall or they're not running, so we skipped that because the ranger said they were "bone dry". However, we did get a nice view of the lake from the lodge. 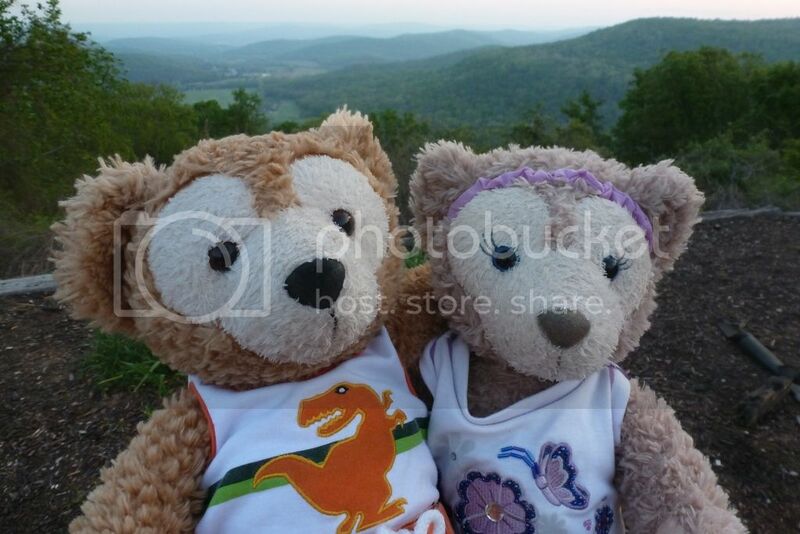 On the way home we stopped at the Huntsville, Alabama Build-A-Bear store. Shellie May noticed one page of our pawsport was completely blank so she decided to try again (in Kentucky last summer the clerk stamped it upside down and Shellie May was very disappointed and upset). "Yay, thank you for getting it right-side up," she told the clerk with a big smile. Last edited by JillT; 04-16-2017, 03:47 PM. We got a room with 2 twin beds that was in what was first class back in the day. I think they completely destroyed second and third class because the rooms were too small for modern hotelgoers. In some cases, they certainly tore down three third-class rooms to make one standard, modernized room! But she exceeded my (admittedly pretty low) expectations in absolutely every way. I'm glad your bears are excited for summer! I don't think mine are and I know I'm not! 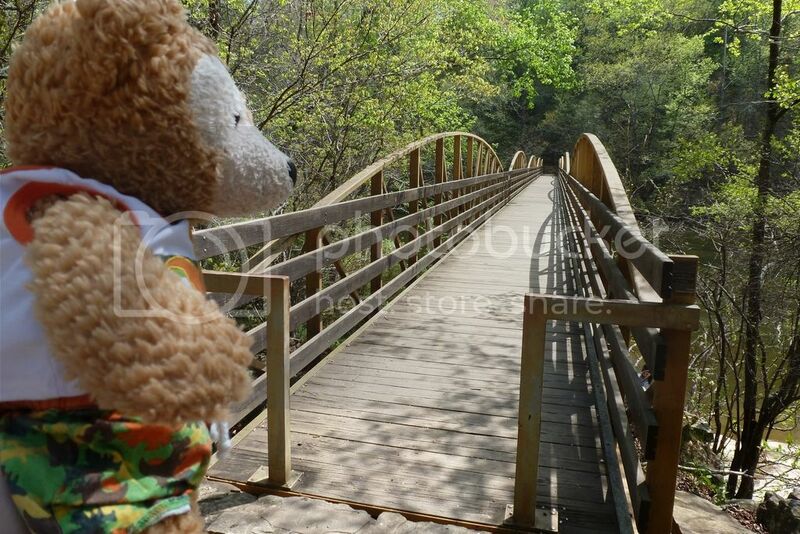 Your photos are lovely and the boardwalk walk looks so convenient….your Shellie May is so sweet! 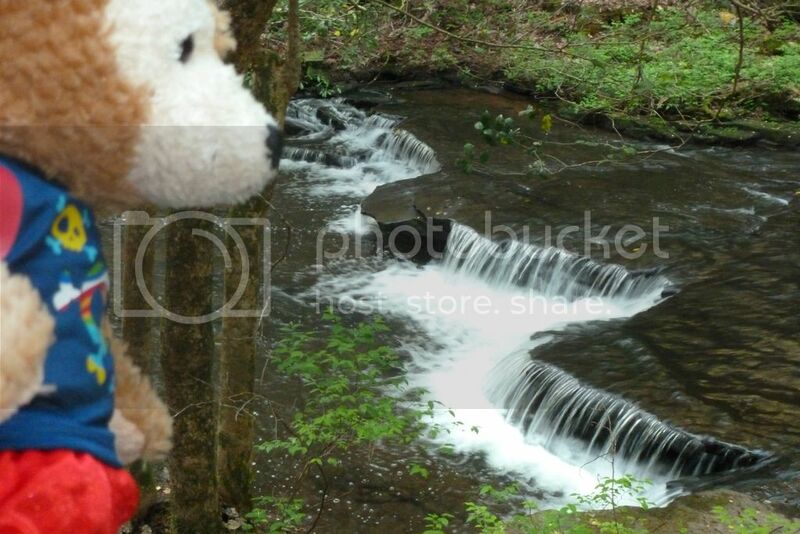 That's too bad nature didn't cooperate with you for that last waterfall…but I'm glad you at least got a Pawsport stamp! Amazing adventures and beautiful pictures, you guys! Welcome Prince Zac. I especially like the blue and green striped shirt outfit. Are you in London? My sister is referring someone to this forum to start posting (smiley). Welcome, Prince Zac! 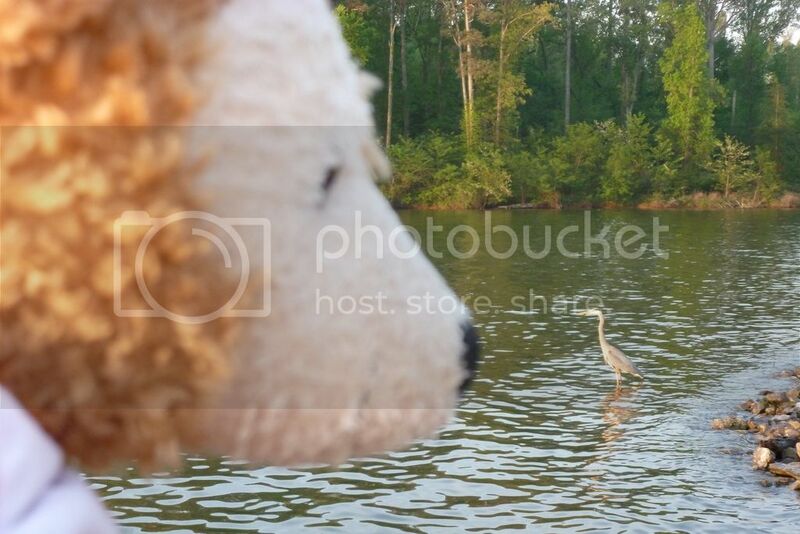 Your Duffy looks wonderful! The boxer photos are cracking me up! 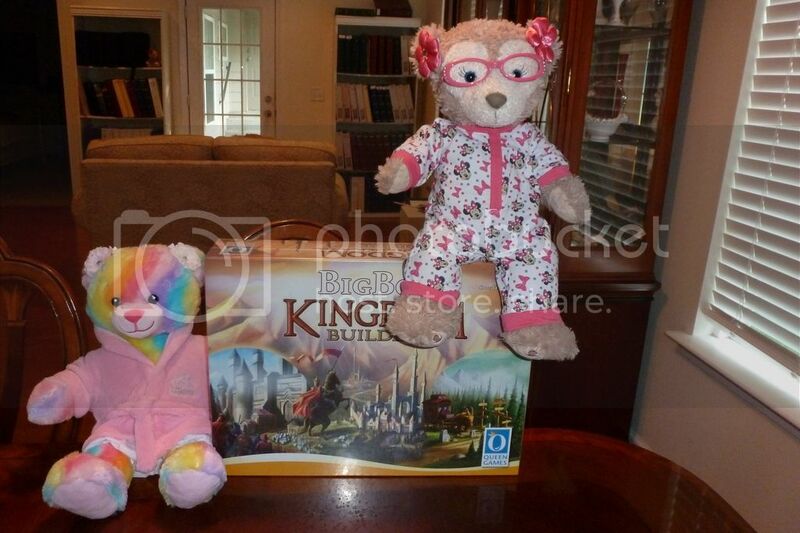 My 17" (regular-size) Duffy has a pair of the white ones. He's gone around just wearing those before too; oh dear. 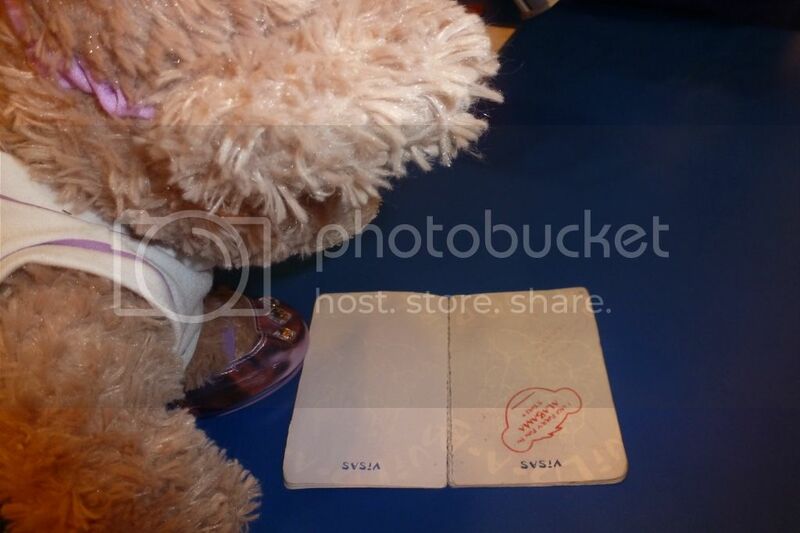 Do you take your Duffy fun places? 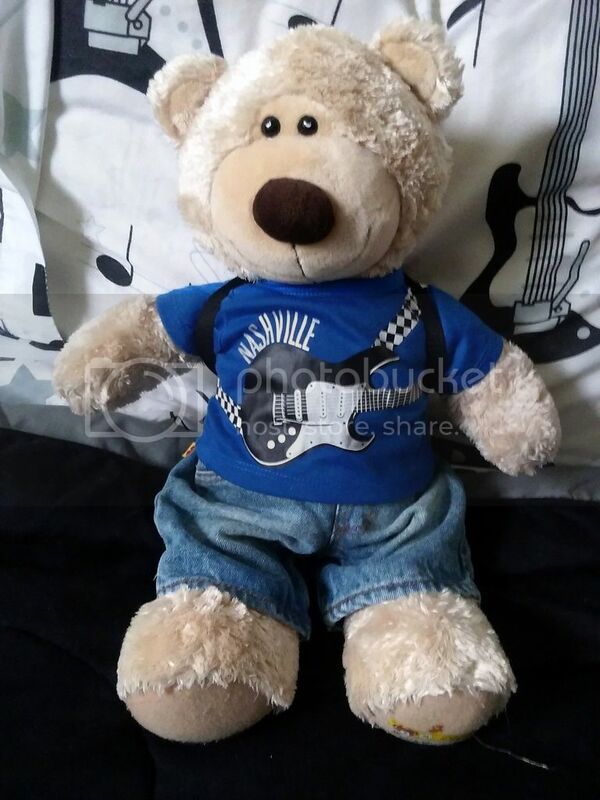 Or is he more of a homebody (home-bear?)? The Queen Mary was so beautiful! This is the main shopping area. Looking out at the parking lot from the enclosed promenade. There were plenty of lifeboats (I think 0-1 were seaworthy, though). The Queen Mary does technically float! "It is almost time for our tour." Now we are waiting for our tour. The Haunted Encounters tour gave some history about the ship but wasn't very scary. OK descending an extremely steep staircase down into the dark bow was a little scary. Our guide did tell us that the giant teddy bear back there comes to life after 10 PM to eat any children who are out of bed! Waiting for the other tour, "Glory Days," which had an incredibly quirky guide. Just a bit more exploring. We ate dinner at Chelsea Chowder House. It was fine...pricey but it's a tourist area. We ran out real quick at sunset because I'd forgotten to get photos of Shellie May with the ship! Last edited by Eeee-va; 04-22-2017, 08:35 PM. Eeee-va, I enjoyed the information about the tour. I'm glad you enjoyed it. Your Shellie May's outfit is nautical. 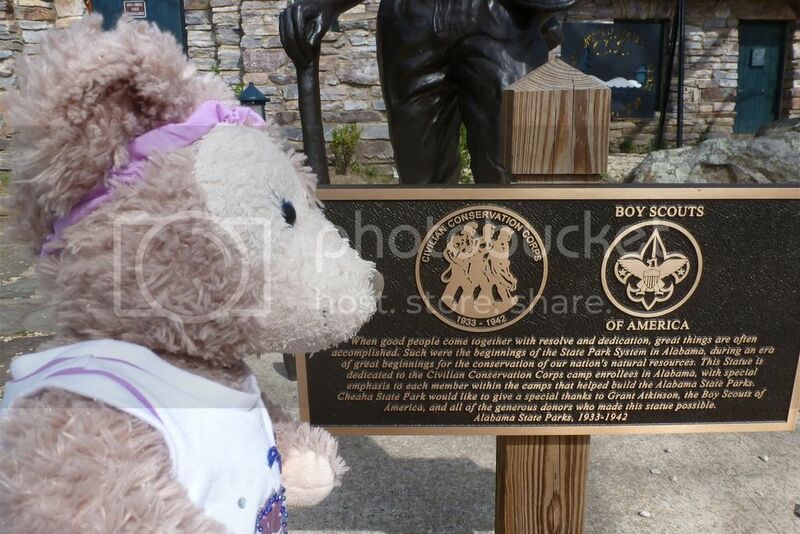 She is such a stylish bear and is lucky to have a seamstress like you for her tender. If you ever go to Oahu, there are two haunted tours. I did the longer one, 5 hours, called Orbs of Oahu. It was really interesting, a little creepy, but mostly just really interesting and culturally informative. Also, in Charleston there is a pirate's walking tour that is amazing. I know those aren't anywhere near where you live, but it's "food for thought" (momism, my sister and I adopted our parents' sayings). Thanks, JillT! I'm not really into "ghost tours" but not adverse if they get you a ton of history and relatively little "ghost" stuff. The "Haunted Encounters" tour was pretty much just relaying stories that they had heard from guests and employees, with no effort to convince anyone they were real. I think ghost hunters would have honestly been disappointed, but I'm not a ghost hunter so it was fine by me. They had a very fine line to walk because they re also a hotel, so they don't want to scare off any potential guests. Back on the Queen Mary, they had a display devoted to the first-class playroom, I believe near or at where it used to be. Though the original first-class playroom had an indoor slide that was about a story long so this doesn't reflect its splendor. This shows off most (all?) of the different types of wood used on the Queen Mary. Looking out at sunset. It was so pretty, we didn't even think much about posing to get cute Shellie May pics. This little delightful bit of history greeted us in our wanderings. Then we stopped at the Observation Bar. Shellie May and I split a ginger ale! Nearly impossible to photograph but it was kind of neat. And we got room service! Brownie sundae!!!! The red line is where our room was on this vintage map. I found another room map and the layout of our room was pretty much like it was back in the day, too. But I think I forgot to thank you for your kind words in that vanished-for-now post, so thank you! Shellie May has brought me a lot of joy, so I think we are lucky to have each other. Roaming Roger likes his Nashville shirt. Today was another glorious day for hiking. First we walked the Fiery Gizzard trail in South Cumberland State Park and saw Hanes Hole waterfall. "Hanes hole water TRICKLE," Shellie May corrected me. 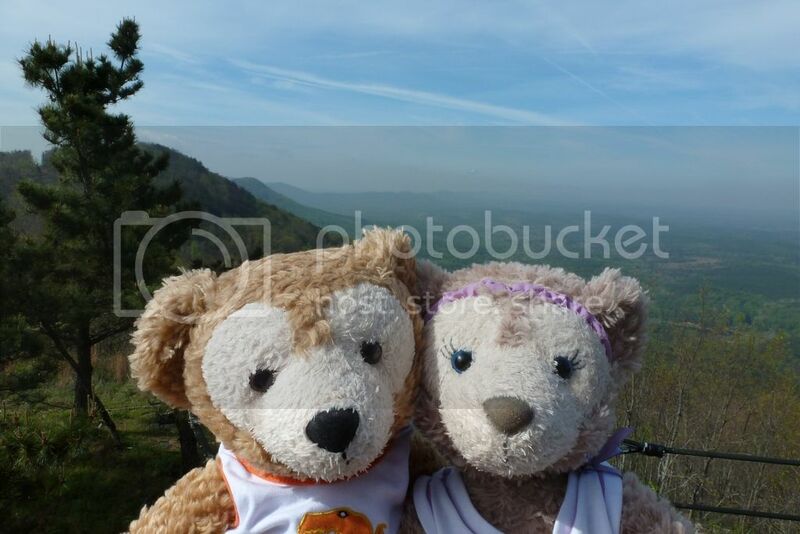 "This is pretty," said Duffy, and Shellie May agreed. 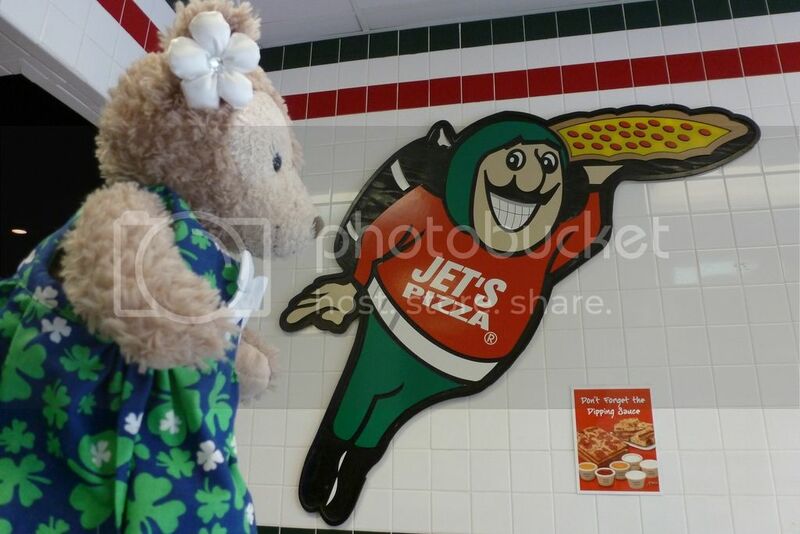 Then we went to Jet's Pizza. 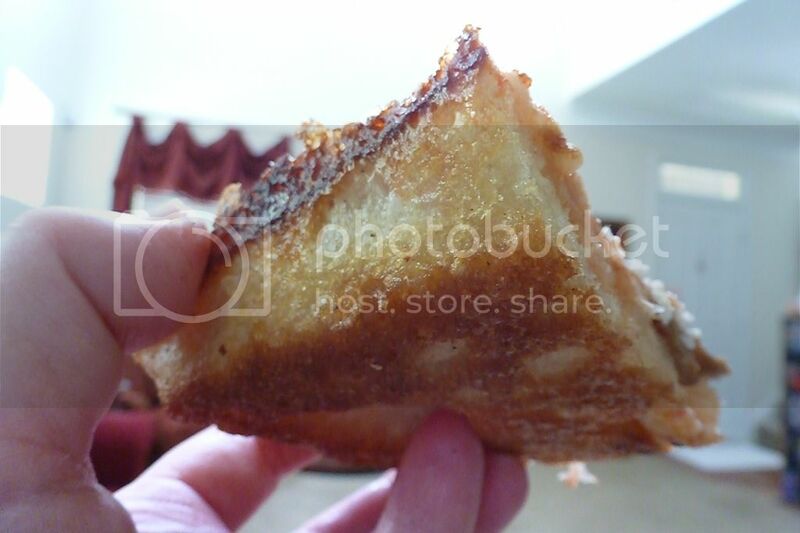 They serve Detroit style pizza, which is baked in a square, buttered pan. It's deep dish but has a crunchy, chewy crust, which is soft on the inside. 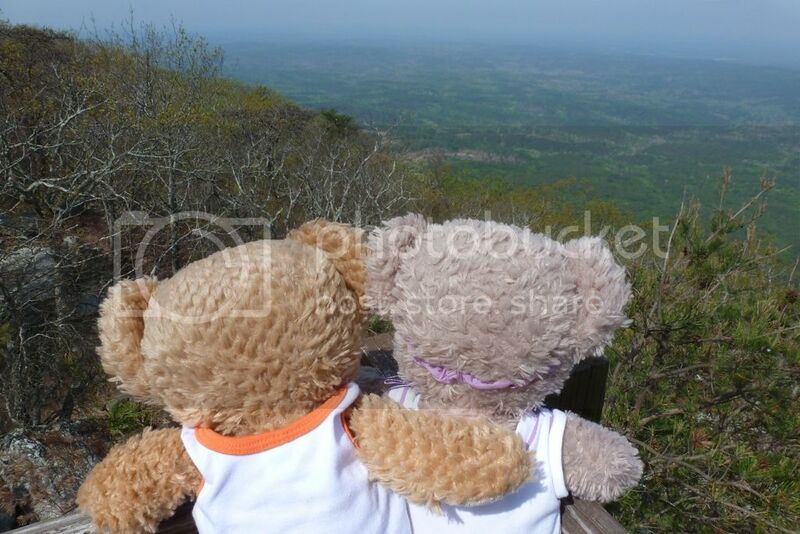 "Hmmm, we might not be able to split, Duffy. 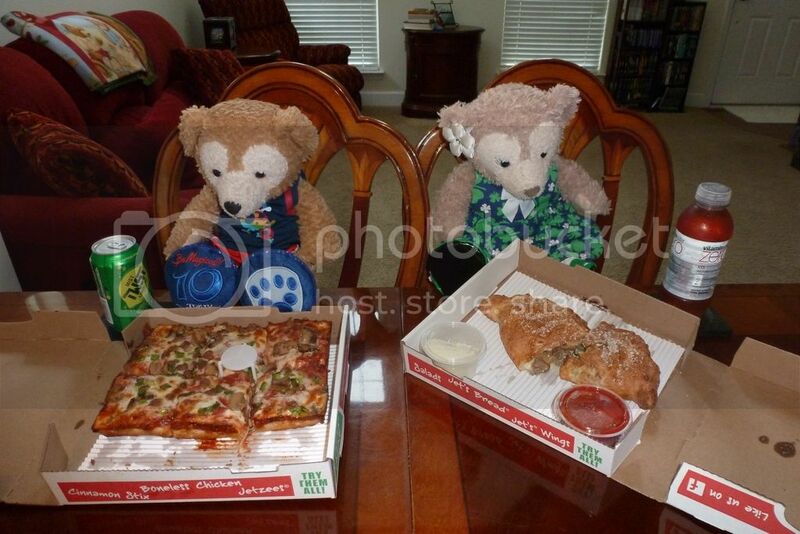 It looks like their portions have shrunk," observed Shellie May. Well, at least we were able to take advantage of their lunch special price. 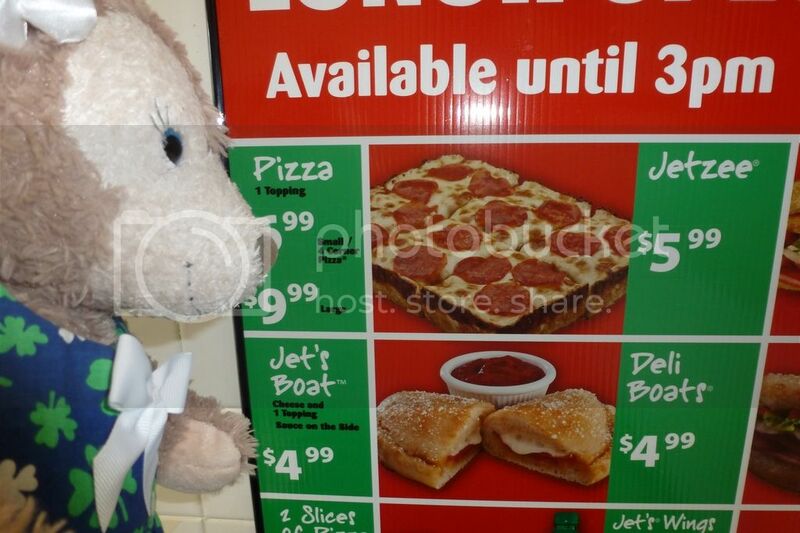 Duffy got a pizza and Shellie May got a Jet's boat (calzone), and sure enough, when they opened the box, the portions are smaller. 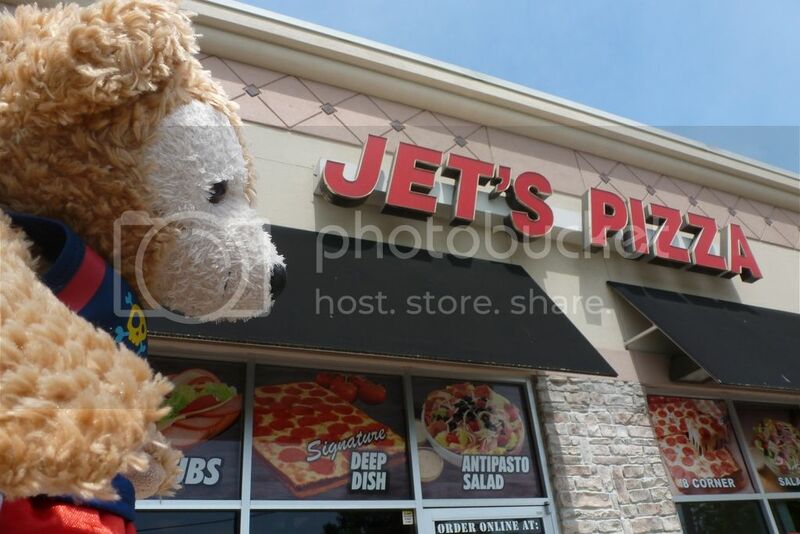 The pizza is supposed to be a square with nine pieces, not a rectangle with six pieces, and the Jet's boat usually takes up more of the box. Also, they no longer carry little parmesan paper packets; they charge 75 cents for parmesan and it's not on the table either. The man taking my order thought Shellie May was adorable, though, and smuggled us some without charging us. "Thank you, mister," said Shellie May politely. Last edited by JillT; 04-29-2017, 11:40 AM. 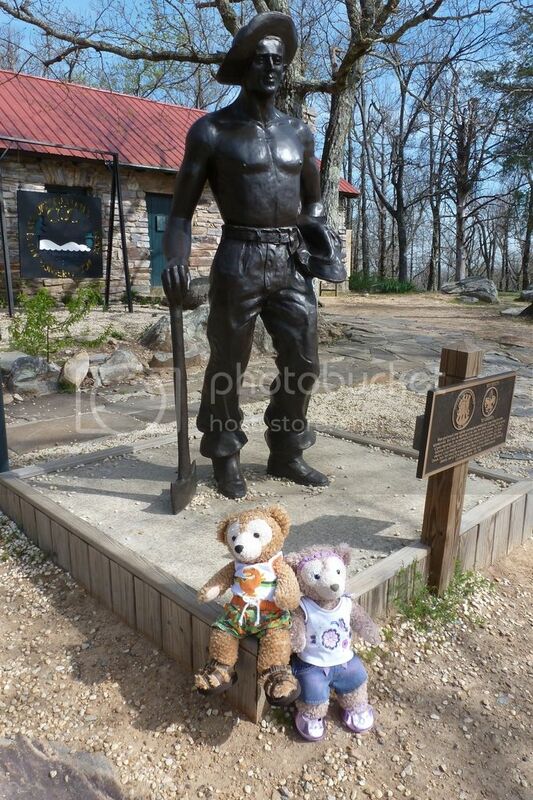 That Nashville shirt is fun, JillT, and what a great hike you guys had! Your trickles still impress me. The next day, we explored some more. The bow was a lot less creepy during the day! Third-class stairs, I'm sure, judging from the bumps on the railing. We got an orange juice bottle and asked for cups and yes, that's what the Starbucks gave us. A nice size for Shellie May, though! Looking back at the first-class Travel Bureau, which was right by our room. Back in the day, passengers could have booked their further travels there! We headed out toward the museum portion of the ship. She looks very reminiscent of Titanic here. My Duffy and Shellie May both seem drawn to ships' wheels. "The engine room is SPOOKY!" Then there's another museum section. We were pressed for time so we ended up doing this part much faster than I would have liked. Maybe someday we'll go back! "Soldiers going to war would have slept in bunks like this!" This deck chair did not look quite so creepy in the deserted museum. And bidding goodbye to our creepy teddy bear friend at the front desk. "I love you, Queen Mary! I hope to come back someday!" What is wrong with THIS picture? It's barely 10 a.m. on a Saturday and we're already back from our flop of a day trip. 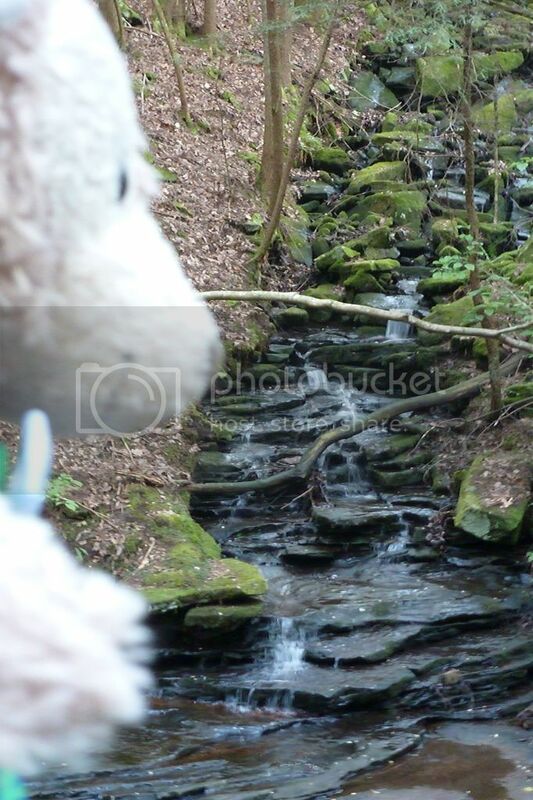 We went to see two waterfalls. 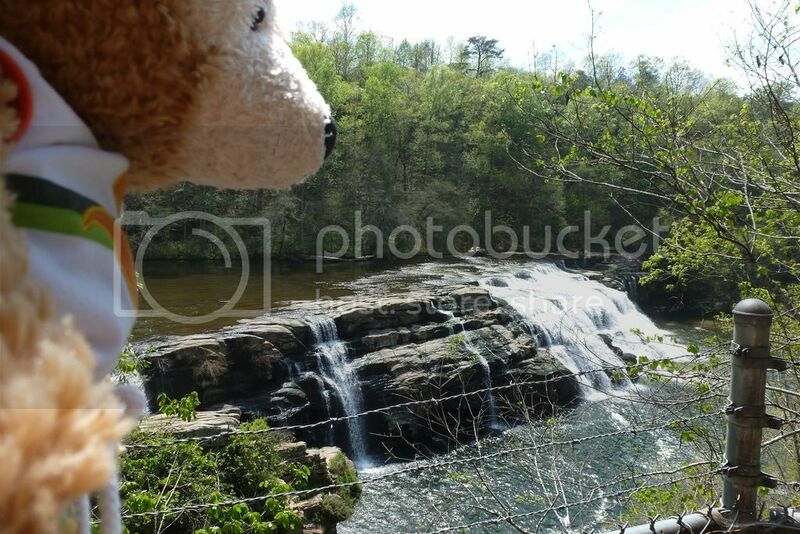 Wildcat Falls, near Sparta, TN is viewable from a scenic pullout across the road and is 35 feet tall. 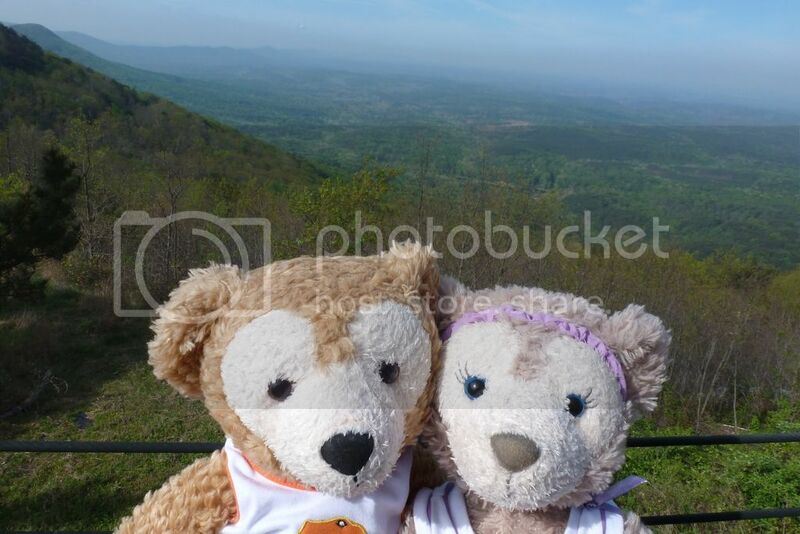 "You can take my picture here," said Duffy, while Shellie May crawled back into the car. 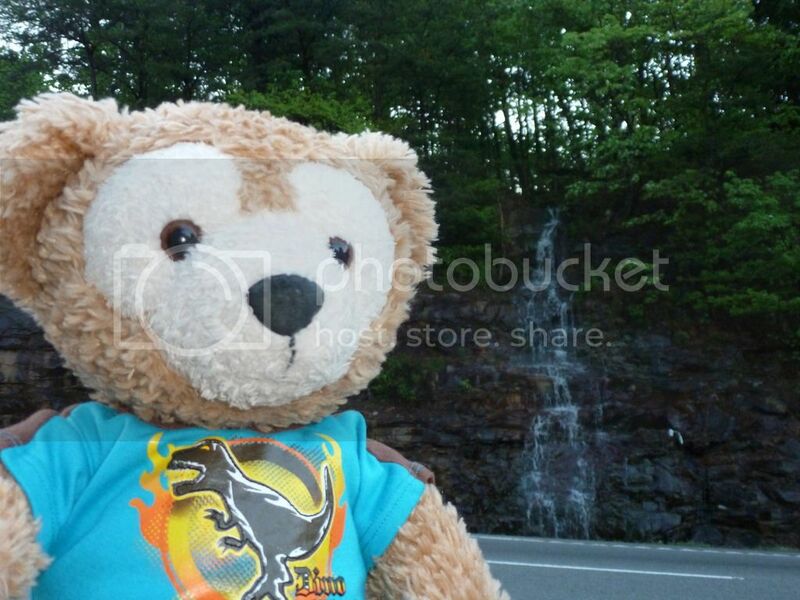 Then we went to Pilot Falls, which was down a rural plop of pavement with giant pothole road. We crossed a bridge and the parking area was black gravel and steep for the first 20 feet and then red clay mud. Um, PASS! It was actually just a fast flowing cascade that we could see from the bridge. 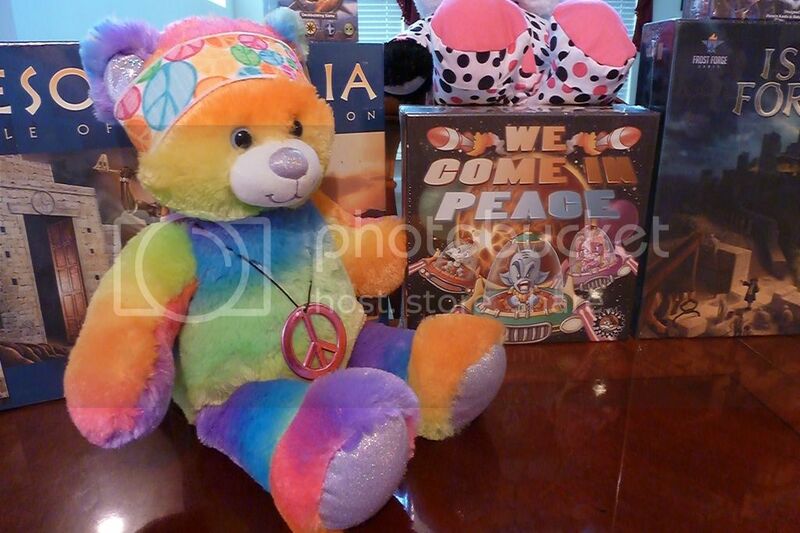 "Oh, wellllllll," said da bears good naturedly as they kept bopping their heads to the song on my ipod. I've lived here a little over 9 years and still have some things I want to see but it's getting pretty sparse, and I'm sort of just finishing up with the nooks and crannies. 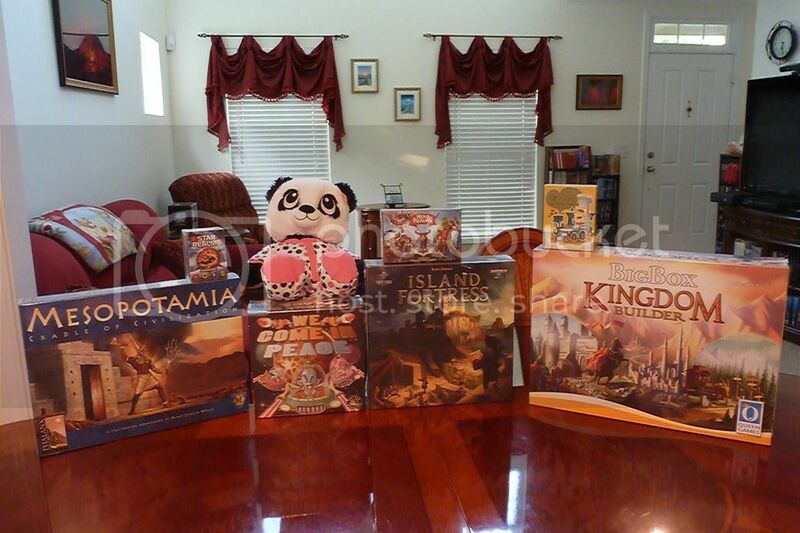 Being a happy hermit homebody with my video games, DVDs, books, and music, and coloring hobby, and playing board and card games is fun for me other than vacations. Back in civilization we stopped at the Homestyle Bakery in Antioch, TN. It has been in business since 1975 and my sister spotted it on one of our day trips in April. "We'll save this stuff for later," said Shellie May. 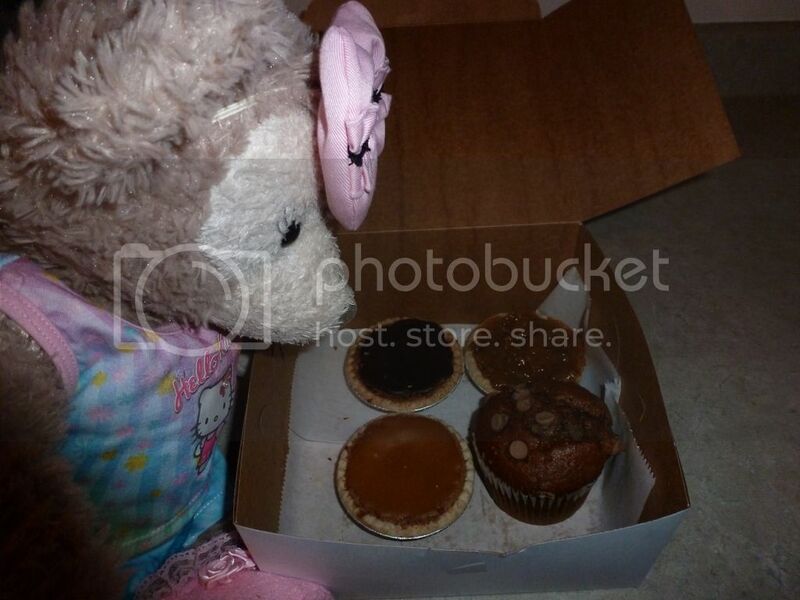 Duffy wanted to eat a lemon cream filled muffin since my sister was raving about that last time. "But I must finish off my palate with chocolate," he said grinning, as he put a chocolate bon bon cake in front of him. Shellie May is eating cookie sandwiches. 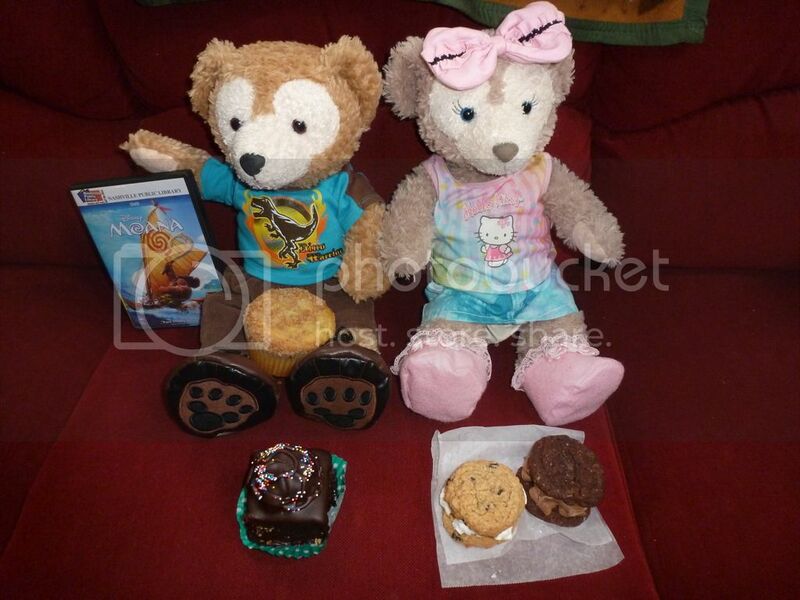 "Be careful with crumbs bears," I told them. We're going to watch the Disney movie 'Moana'. Last edited by JillT; 05-06-2017, 08:39 AM. 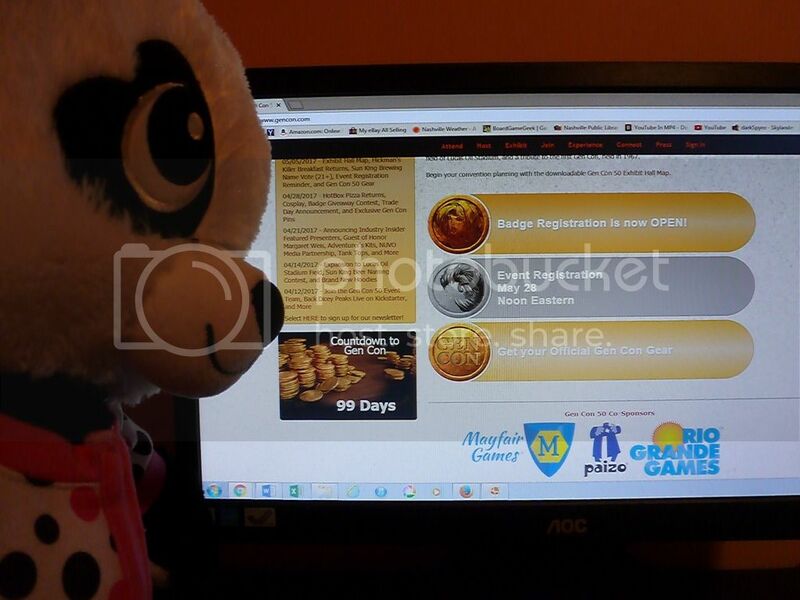 "YAY, at least now we're only in the double digits until Indy GenCon instead of the triple digits," said Zhu Xiong. Last edited by JillT; 05-08-2017, 05:19 PM. We didn't like 'Moana'. It had WAYYYYY too much singing, the plot made no sense, and the characters' faces were um, odd. "A face only a mother could love," said Shellie May glancing one last time at the TV as she crawled off the couch to go do something else. Last edited by JillT; 05-08-2017, 04:33 PM. 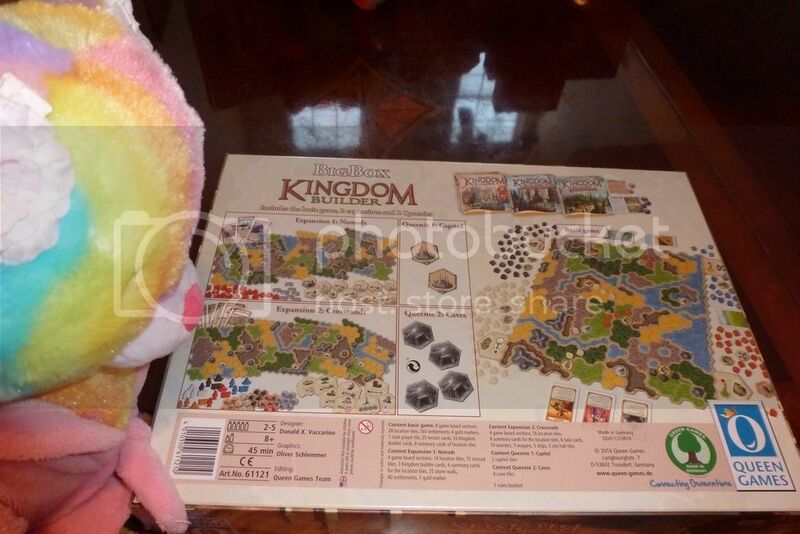 Zhu Xiong is super excited that the exhibit hall map has been published for Indy GenCon. I printed it out on 11” x 17”. This is just the exhibit hall part of the convention center (about 2/3 of the first floor). 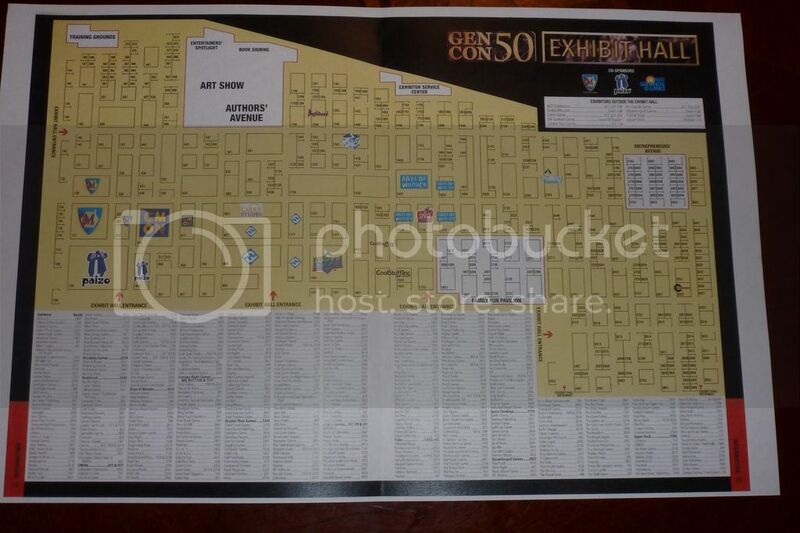 Indy GenCon has also reserved the entire Lucas Oil Stadium diagonally across the street and the adjoining hotels to the convention center also have activities going on. The events calendar will be published 5/17 and we can sign up for activities a couple weeks later. “This is STILLLL the longest countdown EVERRRRRRRR,” said Zhu Xiong. She’s been waiting patiently since the end of January when we got our badge. I haven’t heard “boo” from her. 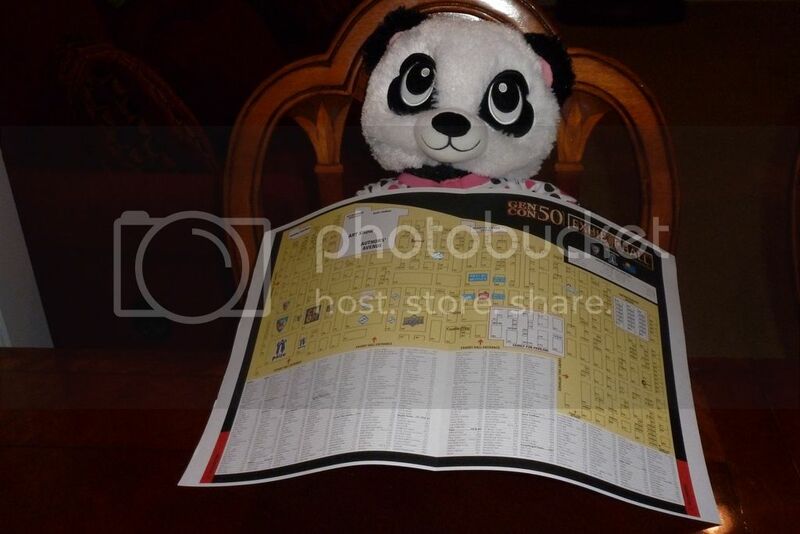 But since last week when the exhibit hall map got published, she went nuts and looked at the events from 2011-2016 along with the program book and did some shopping for stuff we missed during those years. Since we found some good deals and she’s been so well behaved, I went ahead and ordered some games to pacify her as the months keep ticking by. 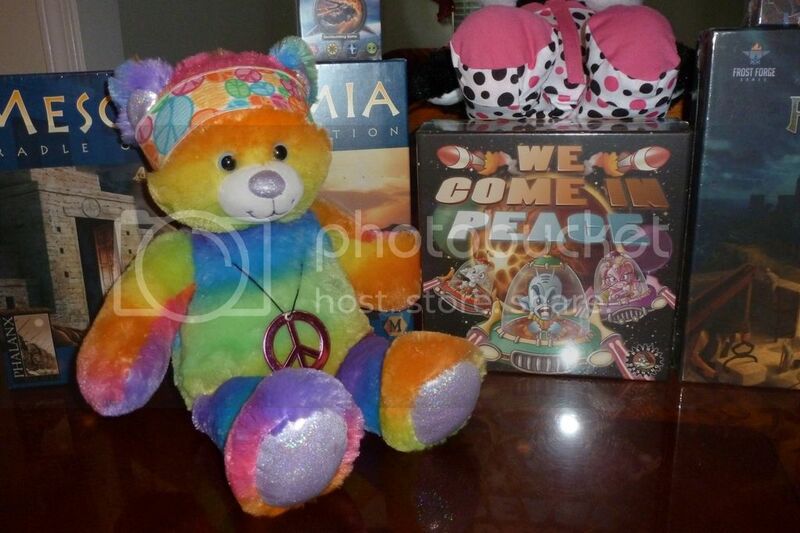 She, Lo ♥ey, and Peace Hippie, my three most mellow, laid back, noncompetitive bears, are going to enjoy them, having a mini GenCon here in Tennessee, starting tomorrow, Thursday, and running through the weekend. Peace Hippie wants to play the game about friendly aliens visiting us on earth. 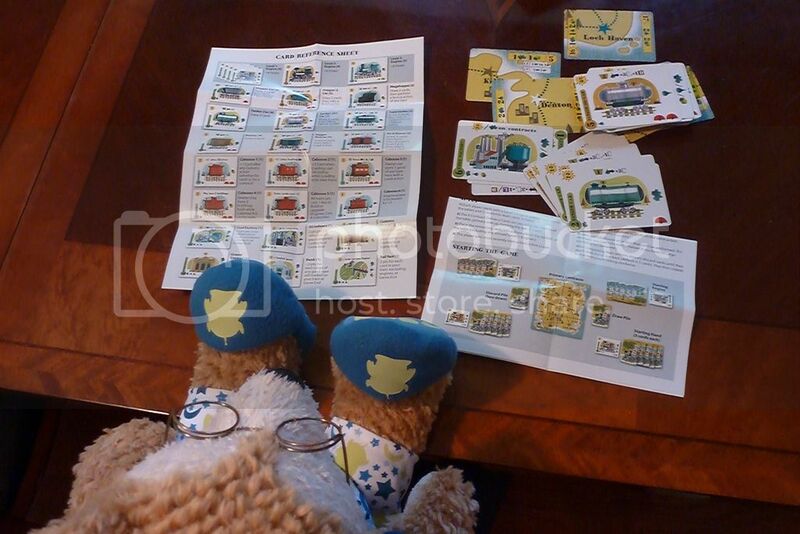 “Hmm, that TRAIN game looks fun, I’ll play that with you,” said Duffy. 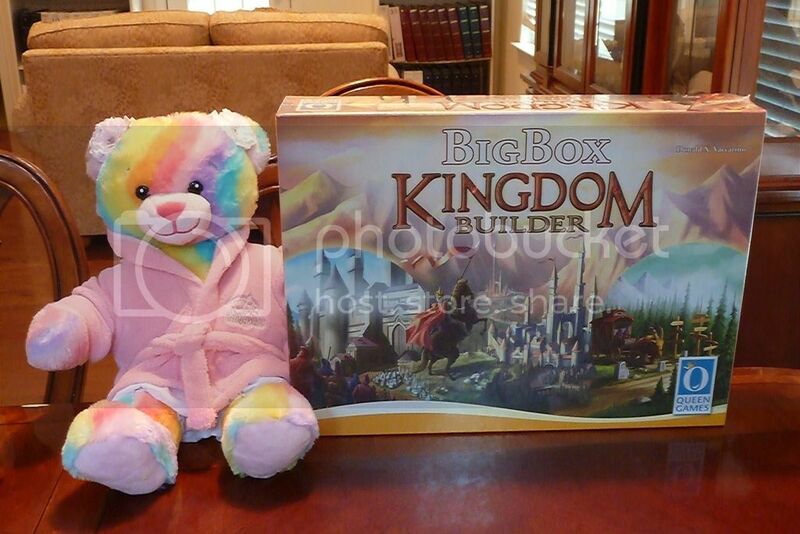 Lo♥ey noticed on the BIG BOX of Kingdom Builder, that the expansion allows FIVE players. "We should play this so we can include Shellie May," she said. "Yes, I'll play that!" exclaimed Shellie May, padding over in her pajamas. I run a VERRRRY casual household. Duffy is ONE SMART STUFFIE. But alas, it’s still three months away! 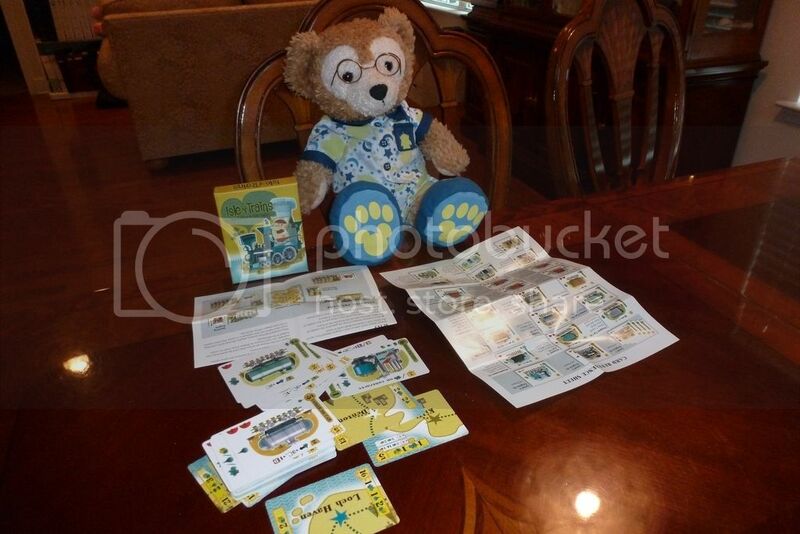 Wow, you and your bears must be so excited about the convention!! Hm, I thought Moana herself was beautiful and her hair was amazing (kind of weird how almost all the guys were built like refrigerators though). Even if she were ugly (and I don't see it myself), I am ready to see some more character in the Disney females' faces (and bodies). Aunt Cass from Big Hero 6 looked so much like Rapunzel, etc. it was ridiculous. Men always get varied looks and I hate that all the women were the same. I'd kind of like to see a homely or overweight Disney Princess but I doubt that will happen anytime soon. But yeah, I only liked the main song; it might have been better not to make it a musical. And I'm not sure if they used a real myth for the story (aside from Maui and his fishhook) or not but the storyline itself didn't hold up to scrutiny very much. I didn't even really get into it until about 40 minutes in. The beginning echoed Tangled too much for me (though I thought Frozen was even more similar overall). I know Frozen is considered the most "amazing" film, but Moana actually made me gasp at the beauty of the scenery multiple times. Now I not only see why people like "the ocean," but I want to go out on it for a few days myself. So I have to give it some points for that. But yeah, I went in with floor-low expectations and was pleasantly surprised. Though I do generally like "princess" movies so that might have helped. Hopefully I will get around to sharing some more pictures too!